Every horse owner dreads having to manage the picky-eating hard keeper. Sometimes no matter how hard you try, or the amount of food you feed, they never seem to fill out. However, much less talked about are the challenges of feeding the easy keeper. Easy keepers come with their own difficulties, perhaps the biggest being how guilty they make you feel about seemingly feeding them nothing. These horses are the air ferns of the equine world, the horses that have absolutely no problem maintaining body weight no matter how little they are fed. To the owners of the hard-keeping picky eaters, owning an air fern sounds like a walk in the park. However, as any owner of an easy keeper will tell you, under the surface it isn’t that easy. The number one concern with the easy keeper is limiting calorie intake, which typically means no high calorie performance feeds and often reduced forage intakes, as well. This is where the challenges begin. In taking away a pound of forage, it is not only calories that are removed. Associated with those calories are protein, as well as a full range of minerals and vitamins. As total feed intakes get gradually lowered in an attempt to reduce calories and maintain a svelte girth, mineral and vitamin deficiencies can inadvertently be created. Another problem with the reduction in overall feed intake can be that this causes stress to the digestive tract. After all, horses are designed to eat constantly for upwards of 16 hours per day. Horses should only ever have their total daily feed intake reduced to less than 1 percent of body weight under the guidance of a veterinarian because a certain amount of feed is needed to maintain intestinal tract function. When we reduce feed intake, we reduce the total amount of chew time that occurs each day. Chewing causes saliva release, and saliva helps to buffer stomach acid that is being constantly secreted into the stomach. Reducing feed intake and chew time therefore reduces the natural buffering of the stomach and increases the risk of gastric ulcers. So how do we mitigate the problems associated with reducing calorie intake? 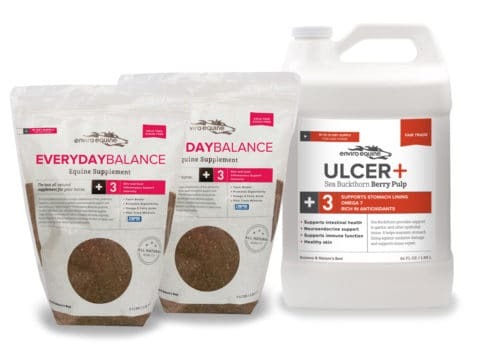 EveryDayBalance Equine was formulated with these concerns in mind, to insure that nutrient requirements are met and gastric tissue is supported with the addition of Ulcer+. EveryDayBalance Equine provides optimal amounts of key vitamins and minerals necessary to insure nutrient requirements are met, and that the diet is properly balanced. 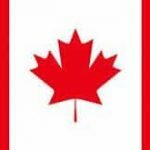 Ground flax seed is used as the product’s base, as it provides a source of omega-3 fatty acid. Research has shown that supplementing omega-3 fatty acids helps improve insulin sensitivity, a condition from which some easy keepers suffer. When fed the full 4-ounce dose each day, EveryDayBalance Equine provides 390 mg. of zinc and 120 mg. of copper, minerals that are often both deficient in the forage-based diets fed to easy keepers. important, and for this reason Zinpro amino acid chelates are used as sources of the copper, zinc and manganese. Other trace minerals in EveryDayBalance Equine include iodine and organic selenium, as well as the key macrominerals calcium, phosphorus and magnesium. Keeping in mind that forages fed to easy keepers are often of lower nutritional value, EveryDayBalance Equine insures a full range of fat soluble vitamins A, D and natural vitamin E, in addition to essential amino acids lysine and methionine. Whole-tract digestive support is offered thanks to the inclusion of 50 billion CFUs of live yeast per serving, plus mycotoxin binders to remove those potentially toxic fungal substances that can occur on some hay and other feeds. A robust stomach lining is key to resisting erosion by stomach acid. This tissue may become compromised during times of stress such as that caused by feed deprivation and reduced feed intake. Sea Buckthorn helps maintain stomach lining against oxidative damage and supports tissue repair. Clinical research in horses has shown that when compared to unsupplemented controls, Sea Buckthorn berries promote healthy glandular stomach lining when horses are faced with a feed deprivation challenge. Ulcer+ is therefore a powerful choice for horses whose feed intake is being reduced as part of a weight management strategy. Feeding EveryDayBalance Equine together with Ulcer+ is an intelligent way to mitigate the problems that can occur when managing the easy keeper. Feeding these products to your air fern can go a long way to providing you with some peace of mind to help ease the guilt that we all feel when having to manage our horses with tough love.